This article is about to introduce the aluminum strip to you, first, we will introduce the material of the aluminum strip. The material of the aluminum strip is the pure aluminum, aluminum alloy cast aluminum roll or hot rolled aluminum roll, and it is rolled into the thin aluminum strip of different size by the cold-rolling mill. According to its application, it will be cut into the aluminum strips of different width by the slitting cutter. Secondly, the most commonly used aluminum belt are 1050, 1060, 1070, 1100, 3003, 3004, 5005, 5052, 8011 etc. There are mainly two states, they are O states and H states. O stands for the soft state, H stands for the hard state. O and H can be used to indicate the degree of hardness and annealing state of the aluminum belt. Thirdly, we will introduce the process of the aluminum belt. 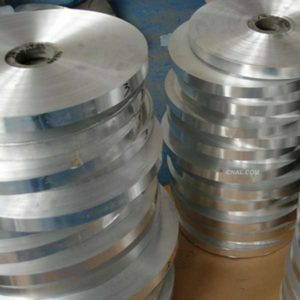 The aluminum strip is the deep processed product by cutting the aluminum coil, which is the main material in industry, according to the alloy elements contained in the aluminum strip, the aluminum strip can be divided into eight series, however, at present, the series 1000, 3000, 5000 and 8000 are commonly used. The processing machine for the aluminum strip is the slitting units, which can cut the strip into proper length and width according to the demand, the copper strip can be also processed through it, but the original material of the electronic products no longer rely on the copper belt, and the electrical conductivity of the aluminum ranks only after the copper, so the aluminum strip has been a trend in international country.